On Friday February 5th 2016 Scoville Sensei presented Little Sensei with his 6th dan. 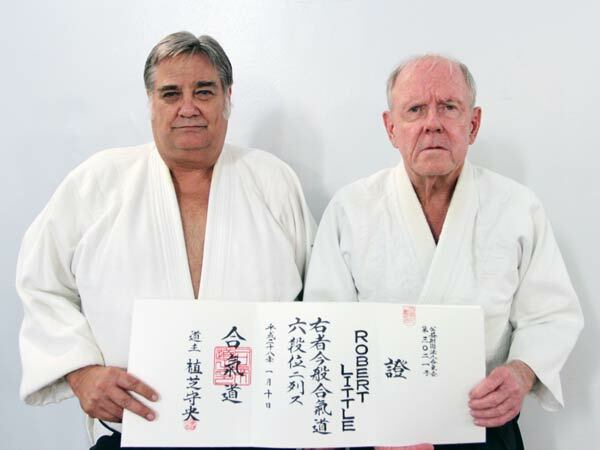 The members of the Nuuanu Aikido club would like to congratulate Dr. Robert Little Sensei on this momentous accomplishment. Little Sensei began his Aikido journey in 1984 at the Nuuanu Aikido clubs Saint Louis dojo, He trained there till 1988 when the schools administration closed the dojo. The following year, September 5th 1988 Yoshioka Sensei open the University of Hawaii Aikido club, Little Sensei was there since the first day. Yoshioka Sensei passed away on January 19th 1990 upon his passing the University Club was left in Little Sensei's capable hands. Little Sensei still teaches class at the University club Tuesday and Thursday at 6:00 am to 7:30am.